On the south-east periphery of Smederevska Palanka – north-east Sumadija, 80 km south of Belgrade – on the left bank of the River Jasenica lies the Palanacki Kiseljak Spa. The waters of this Spa belong to the category of sodium-hydrocarbonate, carbon-mineral hypo-thermal (12.5° – 15°C) and hyper-thermal (32° – 56°C) waters. These waters are used in balneology by drinking, bathing and as table water. According to traditional tales, these mineral springs have been used since ancient times. The first written note was left by the Turkish traveller Evlia Chelebia, who in 1729 described this spa as an “walled spa containing mineral water”. The present-day Palanacki Kiseljak Spa was formed in 1972 when another hot-water spring was set up in the space occupied by the other ones, when the facilities in which mineral water is used for therapeutical purposes, under supervision of medical experts, were erected. 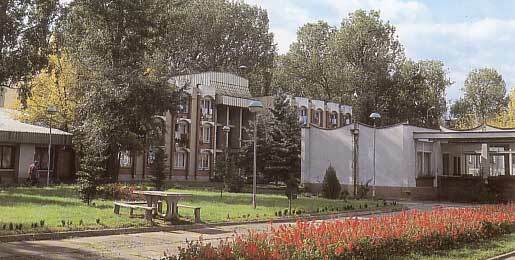 Treating of patients with the use of mineral water and with application of contemporary balneological procedures is organized under the supervision of the Physical and Rehabilitation Service of the Medical Centre in Smederevska Palanka, the premises of which are located in the core of the Spa park. Soiorun of the guests in the Palanacki Kiseljak Spa can be complemented with excursions to the picturesque surroundings rich in cultural and historical values: Pokajnica (18 km), Topola and Oplenac (28 km), Bukovicka and Selters Spas (30 km), the monasteries of Koporin i Manasija, to Smederevo fortress as well as to other monuments and endowments, all in the range of 50 Ion. Palanka is in the vicinity of Kudricko, Vlaskodolsko and Pinosava Lakes, Mikulja forest hunting reservation with a hunters’s lodge and a restaurant; to the village of Krnjevo and its famous wine cellar.